This is the birthday card you’ve been searching for, for that person in your life who is simply larger than life. It has it all—stripes, balloons, confetti, birthday banners! This is a great card for anyone you know celebrating their special day, and it’s sure to start off their birthday with all the right cheer! There’s nothing about this fabulous birthday card that won’t make you smile from ear to ear! Everything about it is just wonderful. Pinks and blues and greens and orang-es… the list goes on! This is a great choice, with a fun background filled with confetti, and sweet verbiage that is sure to please the birthday guy or gal. For the fun-loving, outgoing person in your life celebrating their big day, look no fur-ther than this bright birthday card. The array of colors really catches the eye, while the sentiment of this card is super sweet. After all, who wouldn’t want to be wished the best year ever?! 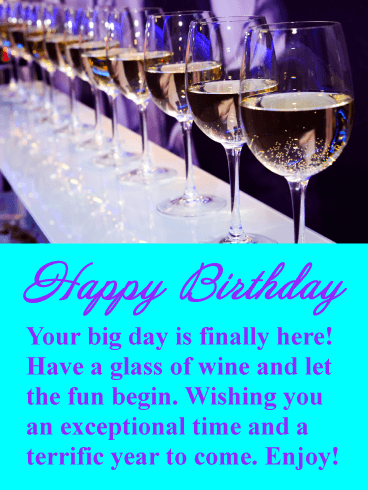 This is a great card to keep on hand for any upcoming birthday. 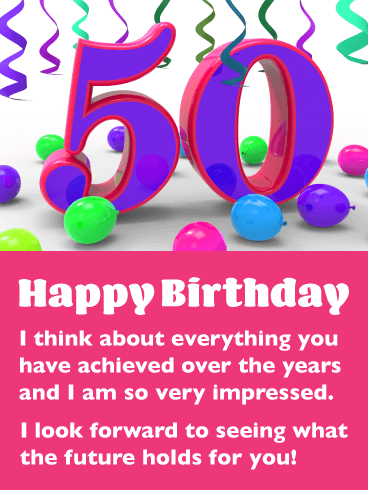 If you want to send a little excitement to someone you know who is turning 50, then this birthday card would be perfect! It features a dazzling number 50 made of sparkling colorful lights! It captures the essence of how important this big birthday milestone really is! 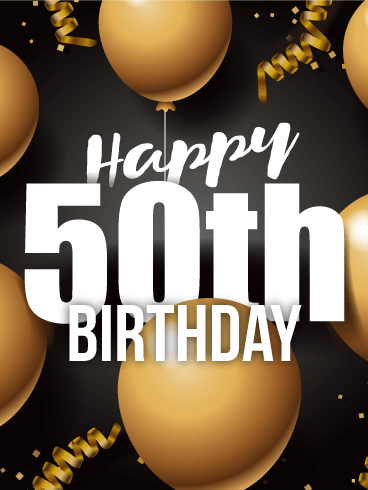 This greeting card will remind them that a 50th birthday is worthy of going out and celebrating to have the time of their life. 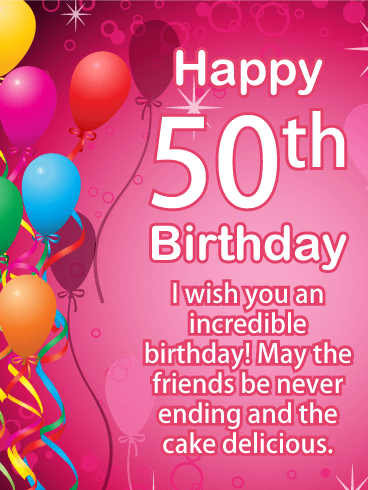 Send this glimmering birthday card out today to make someone's 50th a spectacular day! 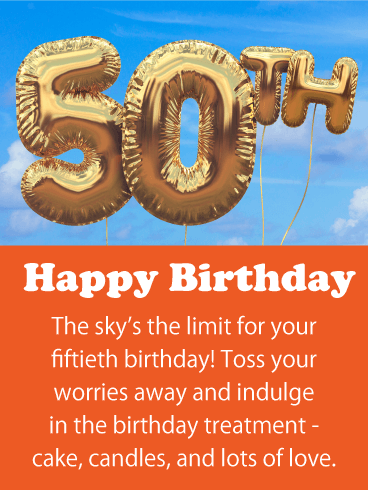 Make someone happy by sending this eye-catching 50th birthday card their way. It contains a touching message that lets them know you are impressed with all that they have achieved. This will certainly make them feel great on their big day. 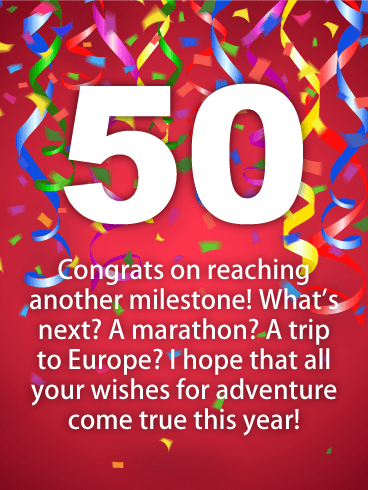 It also displays vibrantly colored festive balloons and ribbons, as well as a giant number 50! Let someone know you are thinking of them by getting this spectacular birthday card out today. 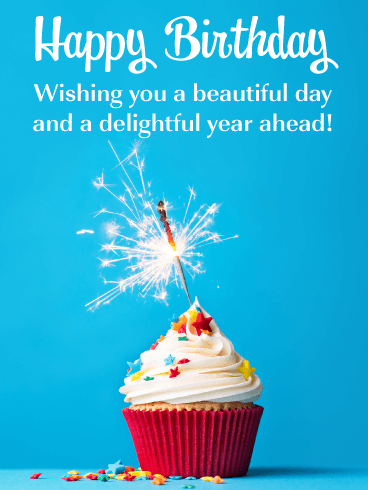 Jumpstart the next year of fun with this festive birthday card! A 50th birthday is not the time to slow down. There are bucket lists to complete, dreams to make reality. Today simply kick starts the next round of adventures! Get them thinking about all the fabulous things they can do after 50. And wish them a very loud "happy birthday!" Make their spirits sing with this heartfelt 50th birthday card. 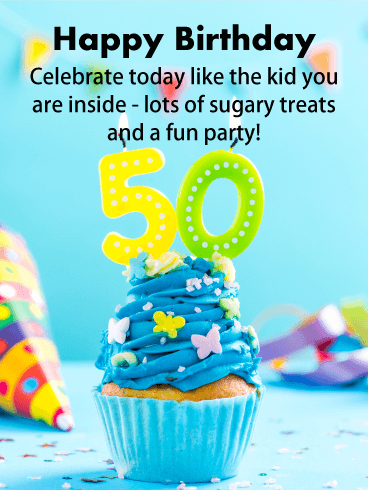 While 50 is a special number, every birthday is a special day and should be celebrated in the same manner - a party with balloons and a spotlight on the guest of honor! Celebrate today in style and wish them a stupendous 50th birthday. Wish them health, prosperity, and the perfect vacation. Get the party started with this festive birthday card! With draping banners and an explosion of confetti, it's hard to see this card and not want to party. And that's all what today is about! A party to celebrate 50 well lived years and the many amazing years to come. Today is only the beginning, and it will start with an amazing "Happy Birthday" thanks to this birthday card. Let them know you're thinking of them on their 50th birthday! Near or far, you never forget a birthday. And this one is a milestone! Let them know that today your mind is on one thing and one thing only. For them to have an amazing birthday and for the year to be full of success and glorious adventures! Let your feelings soar straight into their heart with this 50th birthday card. Let the years slip away and start a birthday celebration that's pure joy. At our core, we are all small children excited by the simplest of things. Summer days. Chocolate cake. And a whole day dedicated to the celebration of ourselves. Fill the day with a burst of birthday cheer and let the birthday boy or girl know that they're not 50 years old today. They're 50 years young. It's a beautiful day for a birthday! Rain or shine, it doesn't matter, because the stuff of birthdays comes from within. Hugs. Pats on the back. Cupcakes with candles. And lots of cheers of "happy birthday!" 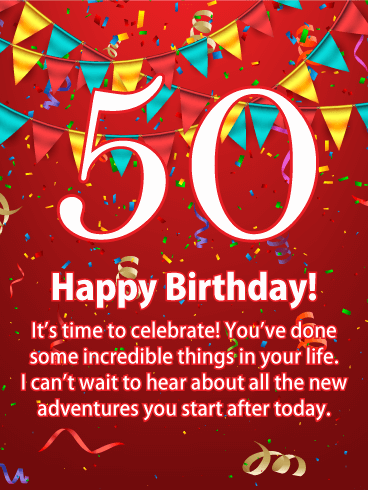 50 is special, so go all out and give them a birthday card full of possibilities. Today is beautiful because of the warmth it delivers, not the temperature outside. Make sure this 50th birthday is nice and toasty. 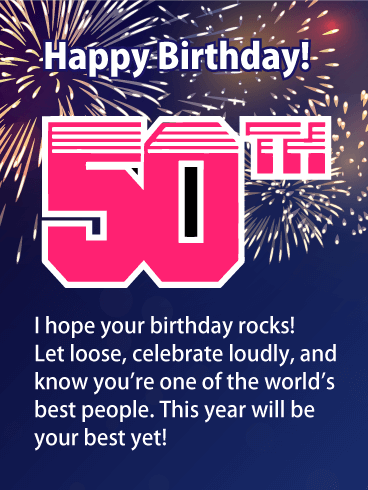 Make their day explode with joy by giving them this card for their 50th birthday! This dazzling display of fireworks is a spectacular sight. Exactly what is needed for a spectacular birthday! This card is going to one of the best people you know, someone kind and strong and encouraging. Make sure you give them the best birthday card you can find. Here's to the 21 year old that we love the most! Cheers! The proverbial Champagne Toast! If ever there was a day to raise a glass of champagne, it would be to celebrate the end of a sober campaign. 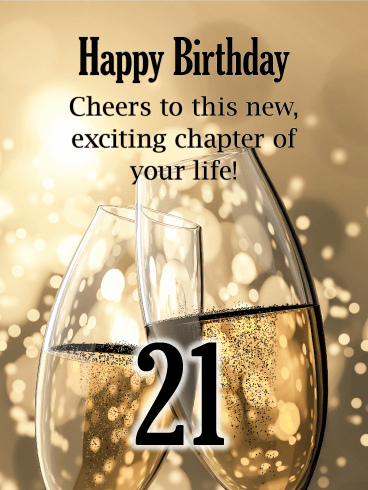 Now 21 is no end to our youthful troubles, but it's definitely a fine time for a glass of the bubbles. Have you ever watched a majestic fireworks display and felt deeply inspired? Firework shows can teach the valuable lesson of not holding back in life or hiding your light! 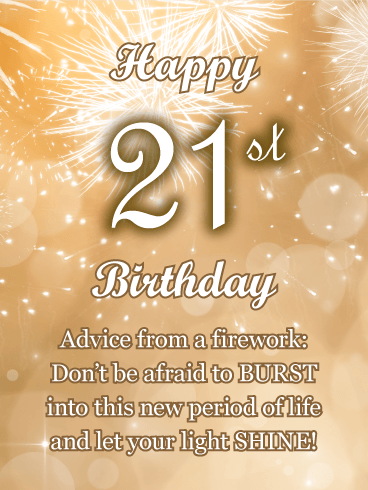 By sending the Advice from a Firework happy birthday card you're spreading that good wisdom on to a newly 21 year old and that's sure to make their big day even brighter! You made it to the milestone! Now go forth and party! The message on this 21st birthday card couldn't be any clearer! Send the Party like a Rockstar card to that larger than life individual to reassure them you've noticed their sparkle and shine! Featuring a giant number 21 made out of fun, colorful stars this happy birthday card won't disappoint! The number 21 stands out boldly over a background of multi-colored helium balloons! 21, wow! A responsible adult age, yet still so young with so much life ahead of them! 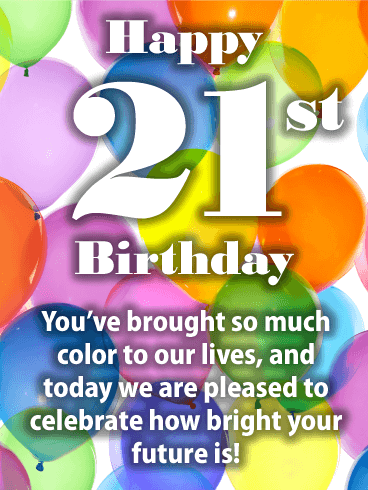 Your twenty-one year old is an ambitious soul with a bright future, so send them this cute happy birthday card to let them know how much you appreciate their colorful, peppy personality! 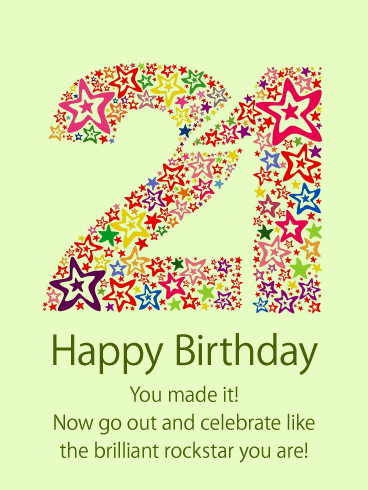 Your 21st year is a very good year! It's to have fun, but use your newfound, hard - earned agency and autonomy responsibly. Now, the curtain is about to rise, and the flash of lights are everywhere! 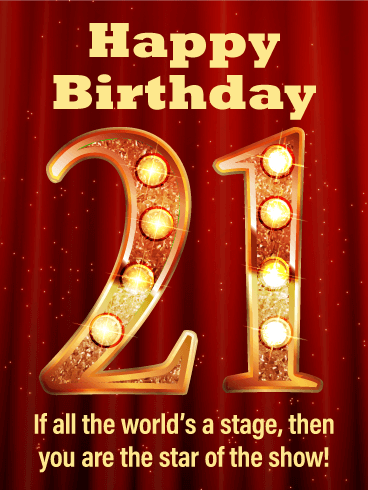 Send the star/starlet in your life this Golden 21 Happy Birthday card to welcome them to this next phase of adulthood! Those interminable years between adulthood and liberty are over! Finally you can join the fray, and celebrate your day with style and panache. 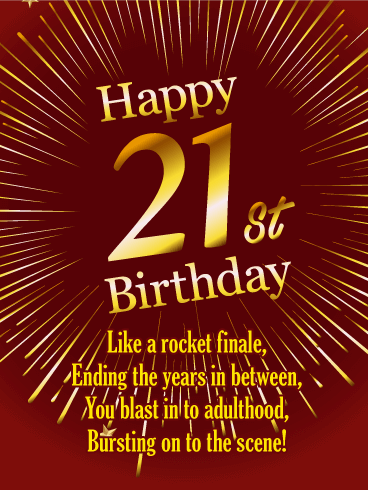 Be a part of that jovial arrival with the Bursting on to the Scene, 21st birthday card. The fireworks display on the card, encouraging conviviality, will start the 21 year old in your life's night with a blast! 1 tequila, 2 tequila, 3 tequila, more! 5 tequila, 6 teakwilya, 7 tipplewipple, floor! Celebrate your arrival unto personal responsibility with all the revelry you can, but remember to get up, and make the decision to use that responsibility to take chances, grow, and live your best life! 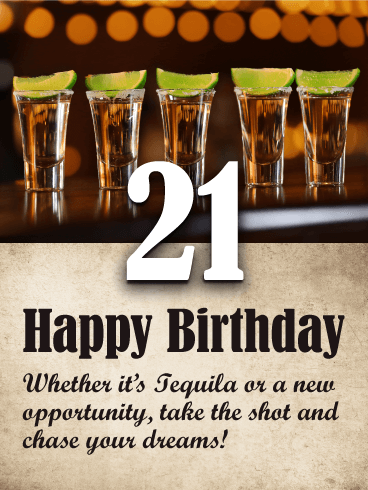 The Time is now, With the Tequila Shots - 21st Birthday card. Remember, you miss 100% of the shots you don't take. 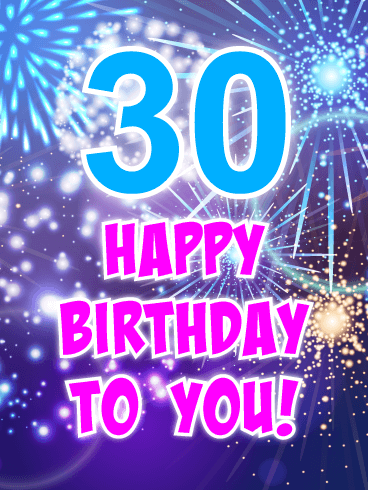 Send the biggest birthday wish ever to someone who is reaching their 30th milestone! This exciting birthday card showcases large balloons of gold that represent someone turning the big 3-0! They are floating high in the sky in honor of this grand occasion! 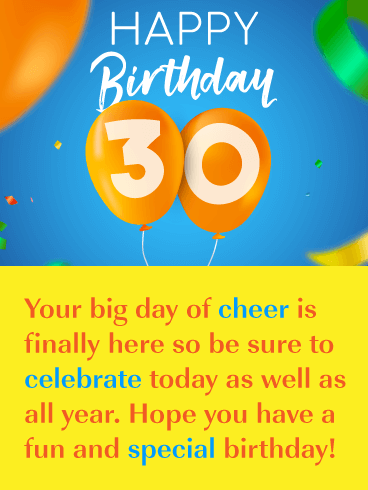 Send this vibrant yellow and blue birthday card out today, it will make any 30th birthday extra special in a very big way! This birthday card features the most irresistible sweets that form the number 30! They represent someone reaching a special milestone that deserves nothing but the best. 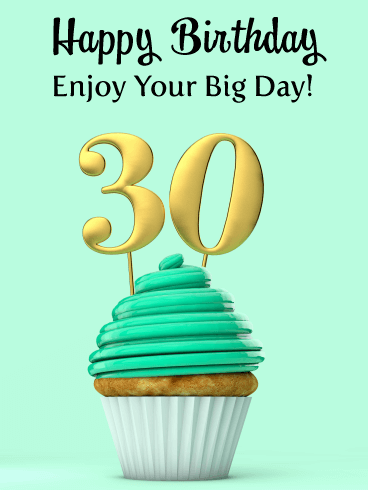 The person who is celebrating their 30th will be happy to read that you feel they still look fabulous, and that they can eat all the sweets they want on this very special day! Send these creative and yummy happy birthday treats over to someone you care about today! 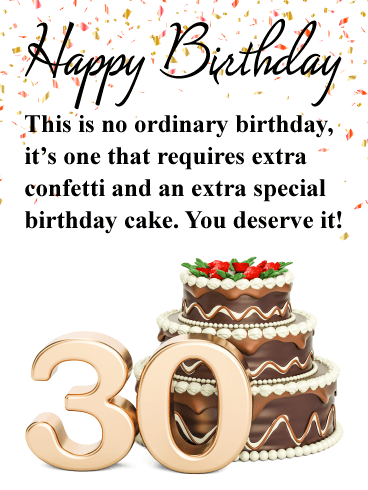 If someone you know is turning 30 and you want to let them know you care, we have the perfect birthday card for you to send their way. 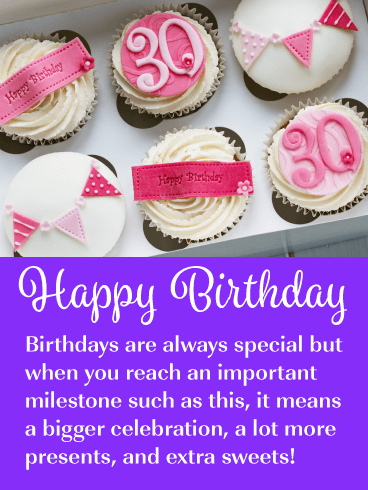 This special greeting card showcases an outstanding frosted cupcake with the number 30 displayed on top. The milestone age was created in reflective gold and looks terrific! Send this sensational cupcake their way to tell them to enjoy their big day! Turning 30 is a big deal and everyone knows it! This is why sending the very best birthday card is essential and will let them know that you care. 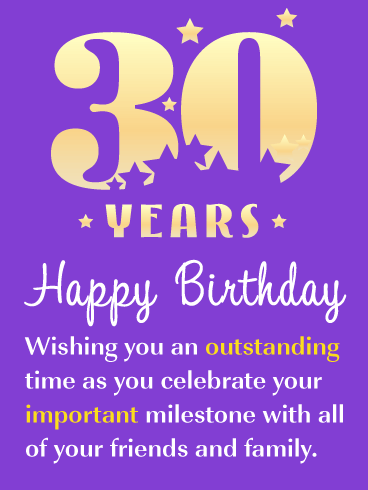 This greeting card features a fabulous number 30 made of gold and was creatively designed with purple stars to match the background. It has a stylish look that anyone would love! 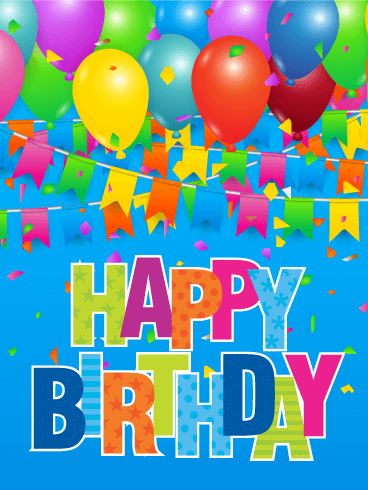 So send this card to someone special to wish them an outstanding birthday as they celebrate this very important milestone! Honor someone's 30th birthday with golden balloons, shimmering confetti, and glimmering numbers! This birthday card has it all and is ready to be sent to someone special that is celebrating their big day. It will wish them a lovely day and show them that you are thinking of them. They deserve to receive the very best and this greeting card is certainly that! 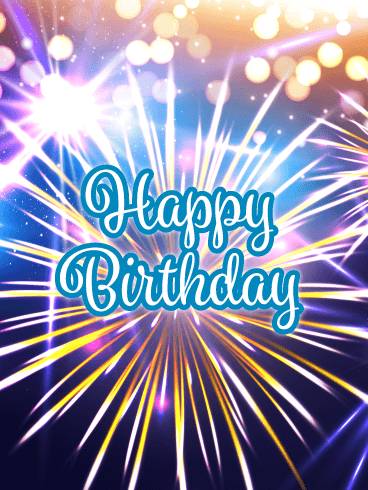 Send this beautiful golden sparkling birthday card out today to wish someone an outstanding day! 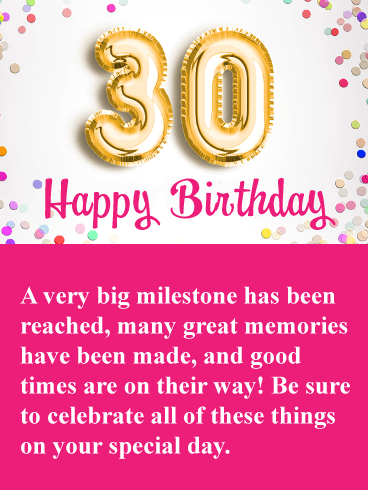 Let someone know that you recognize how significant their 30th milestone birthday really is by sending this fantastic birthday card! It showcases the number 30 created with two golden balloons. This important number is surrounded by colorful celebration confetti and it makes this card very festive! The person who is turning 30 will read that good times are on their way! It's a very uplifting birthday card that will make someone's day brighter! 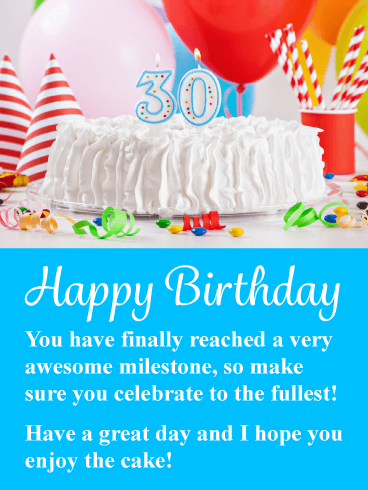 Send some excitement to the person in your life that just turned 30! This fantastic birthday card is bursting with fun elements such as colorful balloons, a sparkling blue and purple background, birthday streamers, and fun lettering! It would certainly add joy to anyone's day. 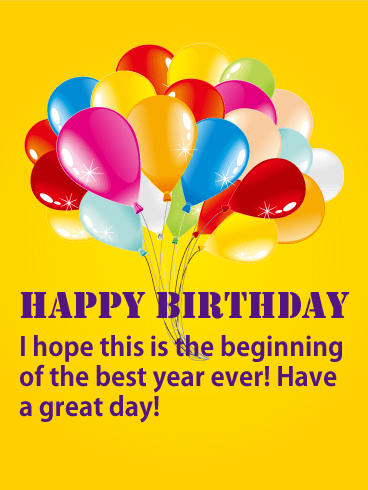 So put a smile on someone's face by sending this cheerful birthday card to them today. They will be so thankful you did! Nothing is more exciting then glimmering fireworks bursting in the sky! That's what makes this 30th birthday card so sensational! It showcases purple, blue, and gold fireworks that were created to celebrate a 30th birthday! The bright pink and blue lettering add to the festive look of this birthday card and it looks fantastic. 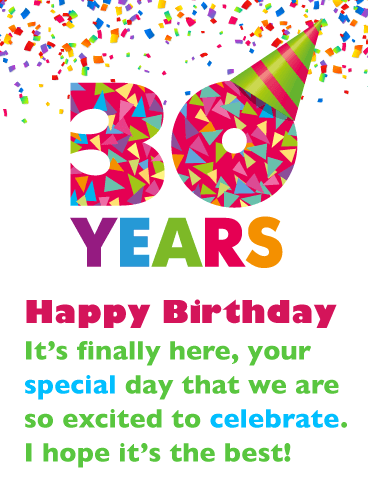 Send a little excitement to someone special that is turning 30 this year by getting this impressive card to them today! 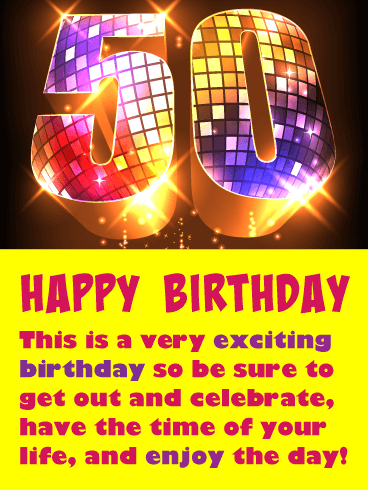 This cheerful birthday card will brighten the day of anyone who is turning 30! 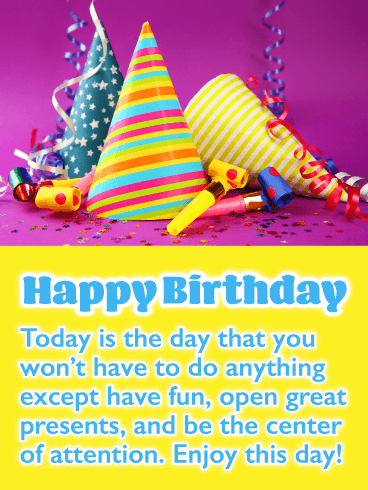 It displays wonderful colors of yellow, orange, and blue, as well as creative happy birthday lettering. The best part is that it features special balloons that form the number 30! It looks very impressive and will make the person in your life who is turning 30 very happy! Be sure to send these fabulous balloons out today! 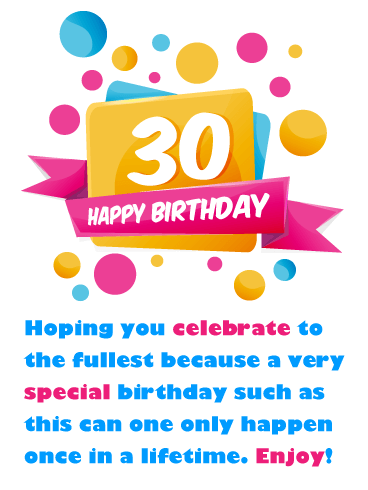 If you want to celebrate an amazing person who has reached their 30th birthday, then this is the greeting card to send! 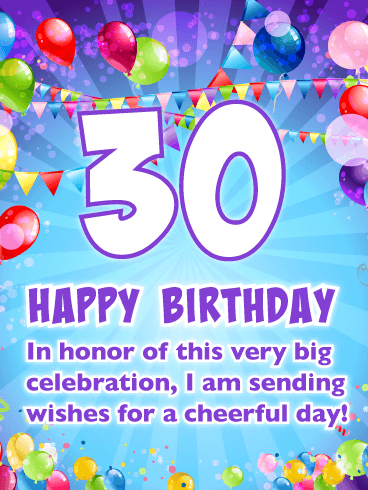 It features a creative number 30 with colorful birthday ribbons that are very festive! The fancy happy birthday lettering looks stylish against the yellow background. It's perfect! It will let someone know that you admire them and that you are wishing them a wonderful celebration. This birthday card will certainly brighten their day! 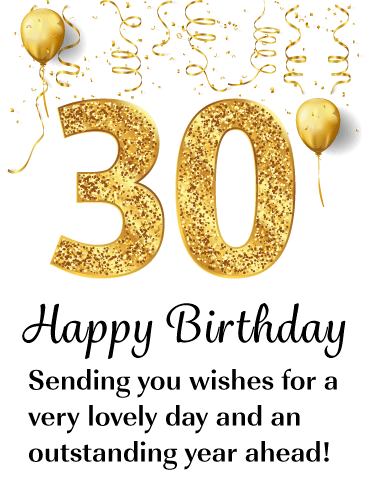 If you are looking for an extra fancy birthday card to send to someone who is turning 30 this year, we recommend this exquisite greeting card! It displays a lovely cake that is decorated to perfection. A large number 30 sits nearby this wonderful cake and represents the big milestone that is taking place. This birthday card also features colorful birthday confetti for extra excitement! 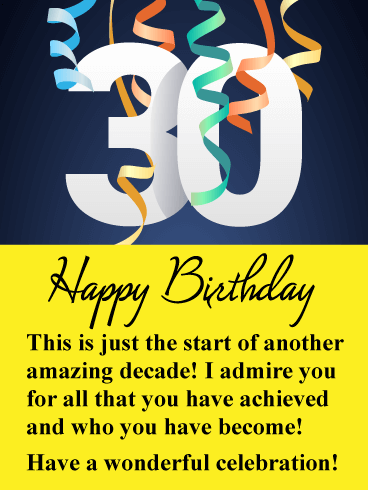 This is an outstanding greeting card to send to anyone who is celebrating their 30th birthday! 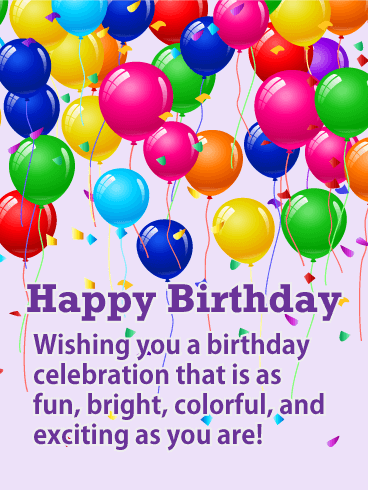 Send a fun and stylish birthday card that will add happiness to someone's day! 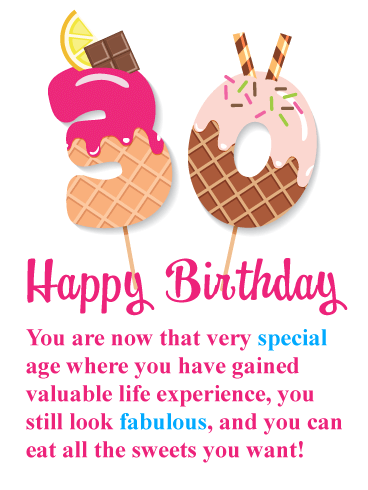 This special 30th birthday card was designed with fun shapes and a colorful design! The message will let someone know that you are hoping they celebrate to the fullest since a 30th birthday only happens once in a lifetime. 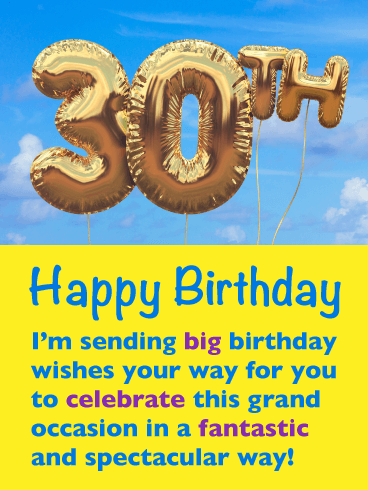 Send this cheerful, yellow, pink, and blue birthday card out today to wish someone a happy 30th without delay! This eloquent birthday card contains shimmering gold numbers that form the very special age of 30. It also showcases a wonderful golden celebration banner, glimmering birthday ribbons, and a sparkling pink background. It's very lovely and appropriate for anyone turning 30 this year. Let someone know that you are thinking of them and that you hope their day is filled with excitement and fun. Send this golden birthday card to someone special today! Birthdays are fun, especially when you are celebrating a big birthday such as your 30th milestone! This birthday card features the number 30 by filling it with colorful confetti shapes and resting a green and pink birthday hat on top! So fun! The multi-colored text adds an extra special touch to this birthday card that would be appreciated by anyone. 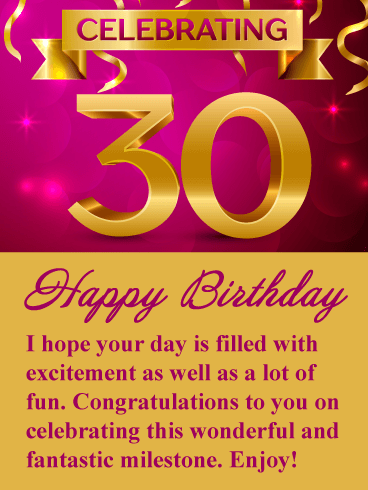 Let someone know how excited you are to celebrate their 30th birthday today by sending this birthday card without delay!